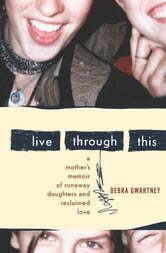 An “achingly beautiful” memoir about a mother’s mission to rescue her two teenage daughters from the streets and bring them back home (Kirkus Reviews, starred review). After a miserably failed marriage, Debra Gwartney moves with her four young daughters to Eugene, Oregon, for a new job and what she hopes will be a new life for herself and her family. But the two oldest, fourteen-year-old Amanda and thirteen-year-old Stephanie, blame their mother for what happened, and one day the two run off together—to the streets of their own city, then San Francisco, then nowhere to be found. The harrowing subculture of the American runaway, with its random violence, its dangerous street drugs, and its patchwork of hidden shelters, is captured with brilliant intensity in Live Through This as this panicked mother sets out to find her girls—examining her own mistakes and hoping against hope to bring them home and become a family again, united by forgiveness and love.